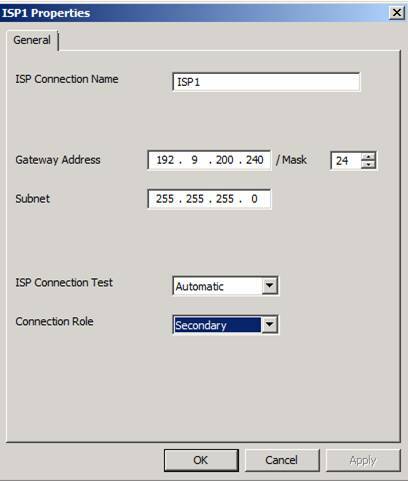 One of the great new features of Microsoft Forefront TMG is ISP Redundancy. 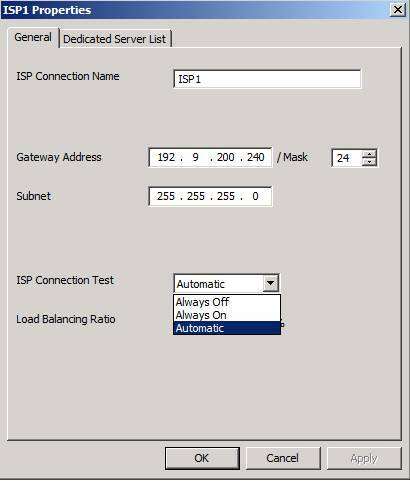 With the help of this feature it is now possible to load balance the network traffic between two different ISPs (Internet Service Providers). One other configuration mode is the ability to configure Microsoft Forefront TMG for ISP Failover. In this case, Forefront TMG will use one ISP link as the primary connection, and if this link gets broken, TMG will automatically failover to the second configured ISP. 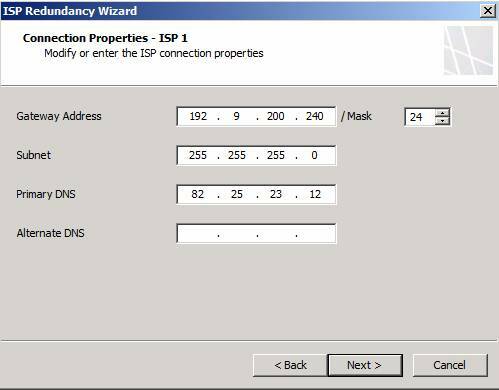 Let us start with the configuration of the ISP Redundancy Mode. Start the Forefront TMG Management Console, navigate to the Networking node and select the ISP Redundancy tab and in the Task pane click Configure ISP Redundancy. 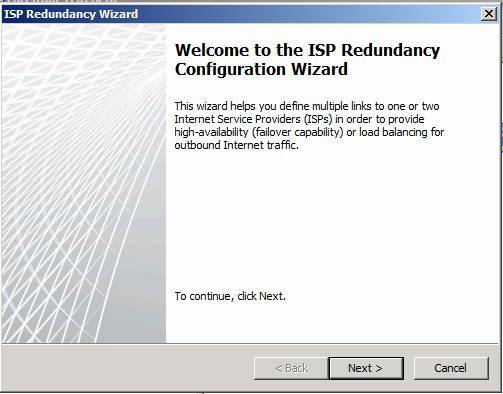 The ISP Redundancy Wizard gets started and will guide you through the configuration process. First you have to choose between two modes for the ISP Redundancy behavior. ISP Load Balancing is used to balance the network traffic between the two configured ISP links. ISP Failover is used to provide an alternative method for a connection to the Internet if the primary ISP link is down due to problems or maintenance reasons. ISP Failover is s great feature for small and medium sized businesses with a simplier network infrastructure which wants to provide failover capabilities for two ISP links. The primary ISP link is often the fastest and cheaper connection and when this connection becomes unavailable TMG will failover to the backup ISP. In our first example we chose Load Balancing between two ISP links. You must specify the Network Adapter used for the ISP. First select a name for the ISP and the network adapter which is used to connect to that ISP. 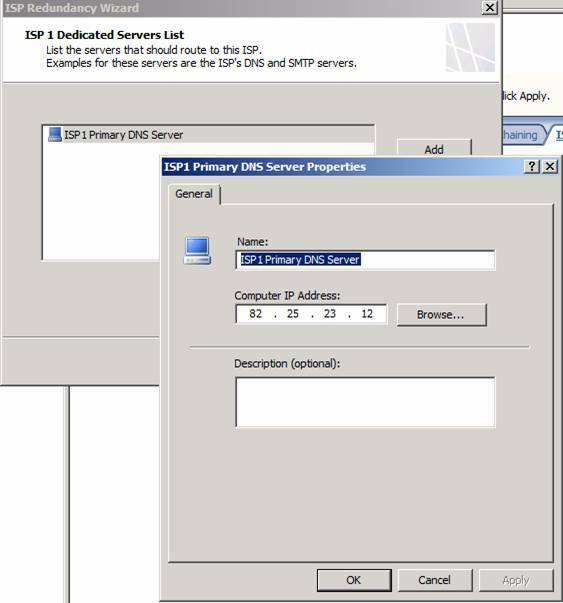 After selecting the first ISP link, the following configuration dialog allows us to configure ISP connection properties like the Gateway IP address and the DNS Server used by this connection. The TMG wizard automatically creates TMG computer objects which can be used as a list of Servers which should route through this ISP. After the configuration of the first ISP has finished you have to configure the second ISP in the same manner as the first ISP. After both ISP connections are configured, you have the choice to balance the load between the two configured ISP. If your ISP bandwidth is the same for both links, what is normally done is to configure an even load between both ISPs. If one ISP has a lower bandwidth than the other ISP, move the slider to set the percentage of traffic this ISP link should handle. 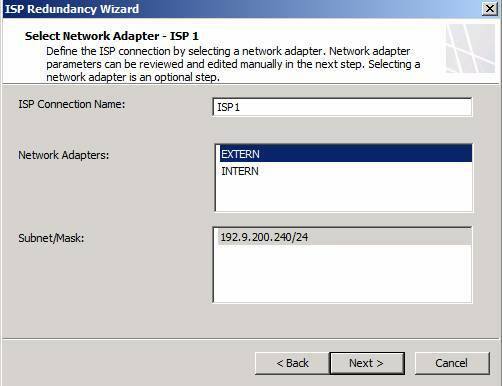 Click Finish to end the ISP configuration wizard and after that click Apply to save the configuration changes. 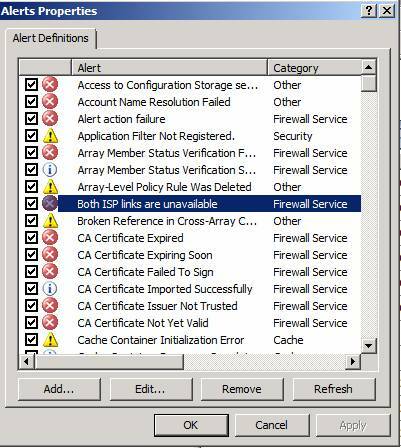 Microsoft Forefront TMG has some capabilities to monitor the ISP Redundancy feature. If you want to see the load and the status of each configured ISP, you can use the Dashboard of the Microsoft Forefront TMG Management Console. The Dashboard function allows you to see the uptime of each ISP and the actually transmitted Bytes per second through each ISP link as you can see in the following screenshot. After successfully configuring the ISP Load Balancing feature, I will now show you how to configure the ISP failover feature of Forefront TMG. 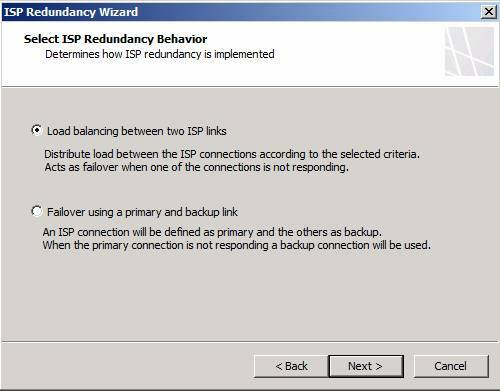 To change the TMG behavior from Load Balancing to Failover, click the ISP Failover link in the task pane of the ISP Redundancy feature tab. The ISP Redundancy configuration has also the option of simulating a broken link or forcing Forefront TMG to mark another ISP connection as active. This can be useful for simulating a broken link or to test the functionality. If one condition reachs this status the Forefront TMG Administrator has many options to get informtion by sending an e-mail or a network message. It is also possible to execute custom commands or to start/stop/restart some services. In this article, I tried to show you how to configure Microsoft Forefront TMG for ISP Load Balancing to failover between different ISPs. This new feature is excellent for small and medium business who want to share multiple ISP connections or want to have a way of failover between a primary and most powerful ISP link and a lower bandwidth link for backup purposes.